BOULDER, Colo. (BRAIN) — PeopleForBikes led another "fly-in" lobbying trip to Washington last week. Members of the board of the North America Bikeshare Association met with lawmakers to discuss the transportation bill and federal policies that affect bike sharing systems across the country. 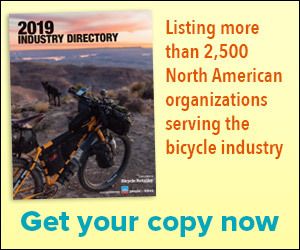 WASHINGTON, D.C. (BRAIN) — The latest list of bike-friendly businesses from the League of American Bicyclists includes companies across 49 states and the District of Columbia. Retailer hopes to exceed last year's donation of 30 Buffalo bikes. RIVERSIDE, Calif. (BRAIN) — Jenson USA plans to repeat the World Bicycle Relief campaign it held last year after Thanksgiving. WASHINGTON (BRAIN) — The League of American Bicyclists announced 55 new and renewing Bicycle Friendly Communities. Eighteen communities received their first BFC award, while 17 new communities received a Bronze designmation and one, Hennepin County, Minnesota, received its first Silver designation. SALT LAKE CITY (BRAIN) -- For the next two years, Scott Sports will support Ride 2 Recovery, a veterans program started in 2008 that promotes physical and mental rehabilitation through cycling. Aside from bikes, the company will support the program with sunglasses and helmets. New Belgium Brewing event series has raised more than $4 million in 16 years. FORT COLLINS, Colo. (BRAIN) — New Belgium Brewing's Tour de Fat, a series of fun bike-and-beer events held around the country, raised nearly $650,000 for bike non-profits this year, bringing its total contribution over 16 years to more than $4 million. CHICAGO (BRAIN) — World Bicycle Relief distributed 220 bicycles to students in Eritrea on Tuesday in collaboration Team Africa Rising, the National Eritrean Cycling Federation, the Eritrean Ministry of Culture and Sport, the Ministry of Education and the UNDP. SACRAMENTO (BRAIN) — The California Bicycle Coalition (CalBike) will host its bike summit Oct. 25-28 at the Wyndham Bayside Hotel in San Diego, Calif.
SAN RAFAEL, Calif. (BRAIN) — Raleigh USA is providing a fleet of bikes to Trips for Kids International for the second year in a row. BLOOMINGTON, Minn. (BRAIN) — Quality Bicycle Products and Kinetic have teamed with the International Mountain Bicycling Association to create the Big Dig Trail Challenge, an initiative that encourages bike industry employees to volunteer hours building and maintaining their local mountain bike trails.